You might remember that I have no qualms about discussing typically taboo topics. (Cottonelle post, anyone?) Well today is no different as i share with you my new favorite inappropriately appropriate product plus a GIVEAWAY! 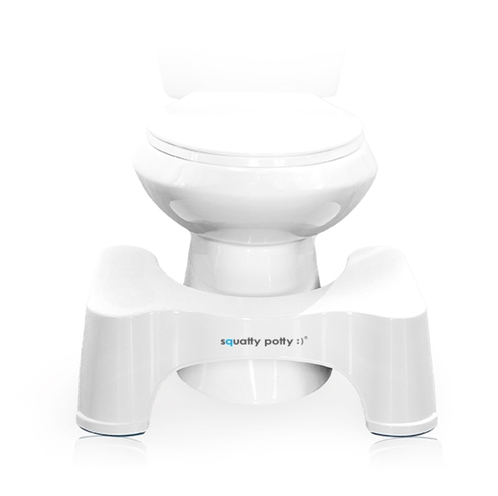 Let me introduce you to the Squatty Potty. This seemingly simple stool has been a game-changer in our home. Let's just say I've had 3 children and things don't always "move" as they should. This handy piece of bathroom furniture has relieved a lot of "pressure." I'm sure I could come up with more annoying puns, but let's just get to how it works, shall we? You can enter to win your own Squatty Potty, as well as a $100 Visa gift card in time for the holidays! What would you buy if you won?